On Sunday May 12 the award ceremony for the UK’s TV industry, the BAFTAs, is being held. 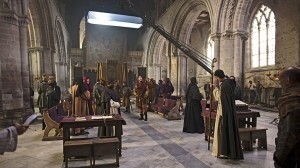 Shakespeare interest is focused on The Hollow Crown, the four-part mini-series which screened during the summer of 2012. The series isn’t badly represented: Ben Whishaw is nominated for best leading actor, Simon Russell Beale for best supporting actor, and Richard II as best single drama. There’s no nomination though for the series as a whole, and the Hollow Crown Fans @HollowCrownFans on Twitter, are so disappointed by this that they’ve decided in their admirably enthusiastic way to have their own, The Hollow Crown Fans awards. If you’re quick you’ll be able to vote. In case you’re not familiar with the series, it consisted of four of Shakespeare’s history plays, Richard II, Henry IV parts 1 and 2, and Henry V. The adaptations featured many leading British actors well known for both their TV and stage work including Jeremy Irons, Tom Hiddleston, Ben Whishaw, Rory Kinnear, Patrick Stewart, Julie Walters, David Morrissey, David Suchet and Michelle Dockery. Here’s the link to one of my posts about the series. It’s available to purchase on DVD for Region 1, and the screening dates for the series on PBS in the USA have just been announced. The screening dates are from 20 September to 11 October. 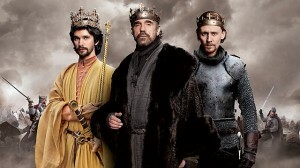 So US Shakespeare fans don’t have long to wait now, and can look forward to the series in the fall. So hotly anticipated have these been that some @HollowCrownFans have purchased the European DVDs and a DVD player that will play them specifically to take a look at the series. There is of course a good deal of Shakespeare on stage this year, but don’t forget that there are also several stage productions to be seen in cinemas. Three plays from the Globe’s 2012 series are being screened: Henry V, Twelfth Night (with Mark Rylance and Stephen Fry, which was a huge West-End box-office hit last winter), and The Taming of the Shrew. Screenings start in June, but some of the dates and venues (especially those in the US) haven’t been confirmed yet. Full details can be found here. The most exciting event of this kind is to be screening of the National Theatre’s current, highly-praised production of Othello which is to take place in September. Booking is already open, and check here for dates and venues. This entry was posted in Legacy, Plays and Poems, Shakespeare on Stage and tagged @HollowCrownfans, Henry V, National Theatre, Othello, Shakespeare's Globe, The Hollow Crown, The Taming of the Shrew, Twelfth Night. Bookmark the permalink. I just think it’s awesome that people are so excited about an adaptation of Shakespeare’s histories that they’re splashing out on imported DVDs and equipment to be able to see it early. Ben Wishaw was outstanding as Richard II. I loved these adaptations so much that I bought them on DVD. I am really excited about the Twelfth night because it has received so many awards and as I missed it first time around. If Taming of the Shrew if it is the all women version it should be good .I am actually going to see Othello in June .I am not a huge of Rory Kinnear performances but perhaps this will change my mind.